Model Bella Hadid Showed Off The Contents Of Her Fridge And We Are Shook! - Bold Outline : India's leading Online Lifestyle, Fashion & Travel Magazine. It’s three weeks to the much-hyped Victoria’s Secret show in New York – and supermodel Bella Hadid gave her fans a glimpse inside her organised fridge and her food choices, too. 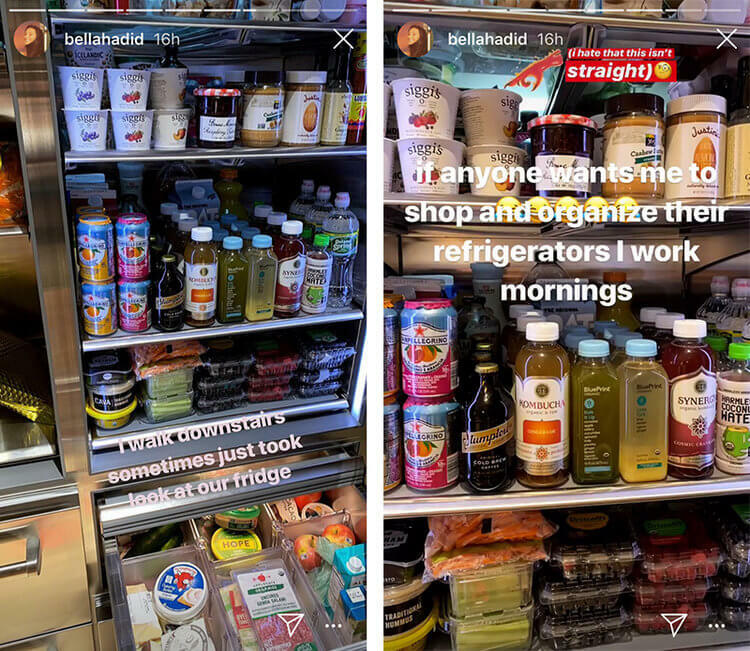 Hadid posted some photos of her fridge (or her and the Weeknd’s fridge, since they’ve reportedly just moved in together) on her Instagram story. ‘I walk downstairs sometimes just [to] look at our fridge,’ she wrote, over a freakishly perfect photo of a glass-doored fridge brimming with healthy products. We can’t get over this 22-year-old’s disturbingly perfect fridge and its impeccable organization. The Hadid family is known for having an insane fridge anyway. But with such a busy schedule modelling around the world we’re pretty darn surprised the sister of fellow model GIGI Hadid has time to eat at home, let alone organise her fridge. ‘If anyone wants me to shop and organise their refrigerators, I work mornings’, she writes sharing a peek of her groceries. So let us have a look at what we were shown in this celeb’s fridge, shall we? On the top shelf, Hadid stores fat-free Icelandic yoghurt in fruity flavours like peach and berry. There’s also raspberry preserves for some sweetness, as well as cashew butter from Whole Foods and almond butter, for plenty of healthy fats. On the middle shelf, Hadid organizes all her beverages: coconut water, kombucha, San Pellegrino, Blueprint juices, and oat milk from Oatly. The shelf below is home to fresh produce like carrot and celery sticks, pints of raspberries and blackberries, Cava and Hope hummus, and Gotham Greens Pesto. In the drawers below, Hadid showed off some apples, cheese, more hummus, and organic uncured salami. She is also obsessed with organic healthy drinks, favouring the likes of Kombucha organic and raw, Blueprint organic drinks and coconut water. However, Bella does indulge her sweet tooth, with not-so-healthy cans of pomegranate flavoured San Pellegrino drinks. Typical butter is replaced with almond, cashew and cacao butter and cow’s milk has been substituted for Oatly milk. Well, Bella, that is all we do- If we want to eat something, we eat it right away. Probably that is the reason for the belly we carry around.